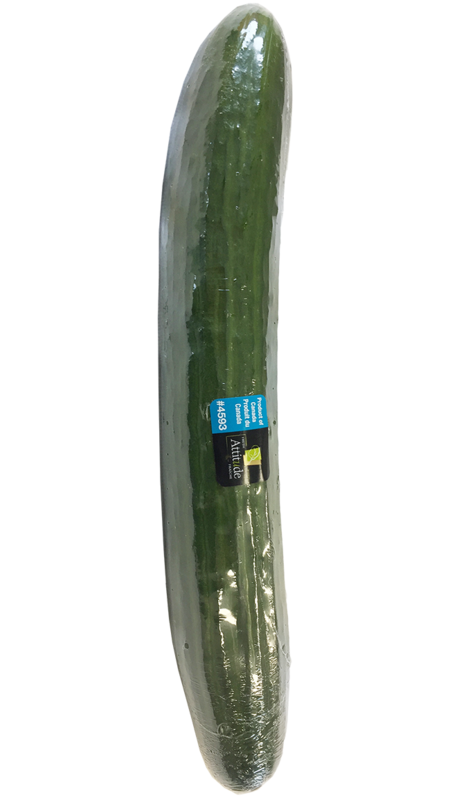 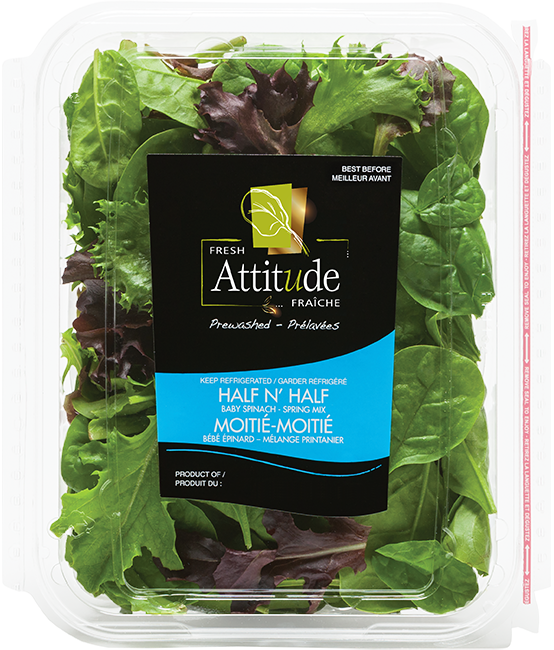 Try out our prewashed fresh lettuce blends offered in sizes of 142 g (5 oz), 312 g (11 oz) or 454 g (16 oz). 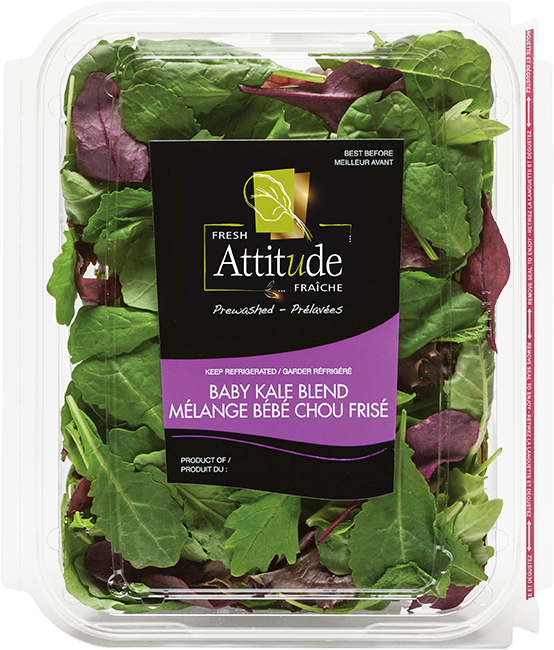 From baby spinach to cut romaine, each blend or mesclun salad is assembled from field-grown lettuce leaves from sustainable farming to provide a distinct tasting experience and colourful plate every time. 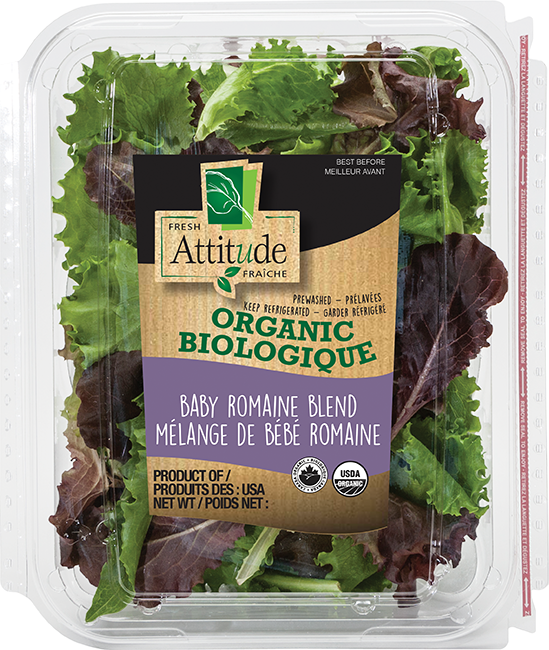 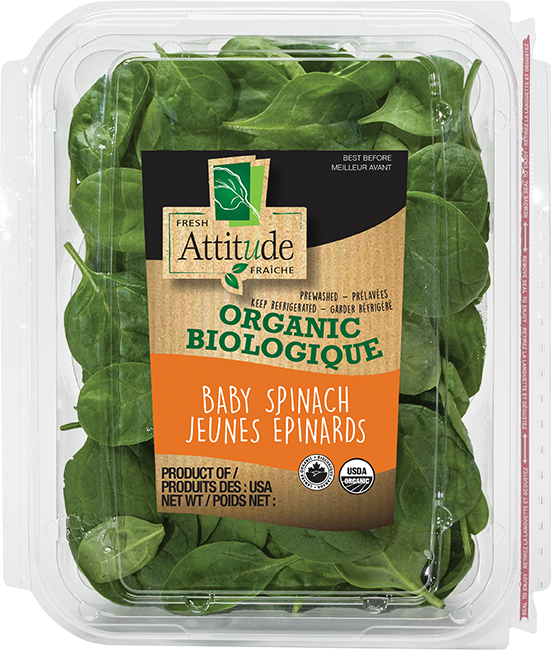 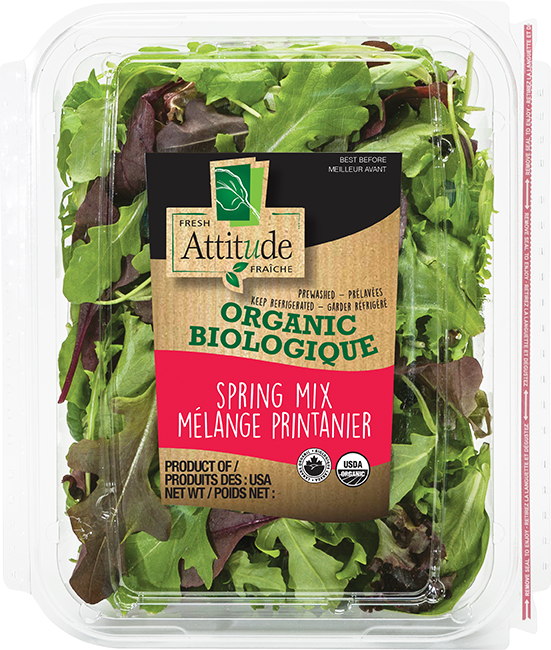 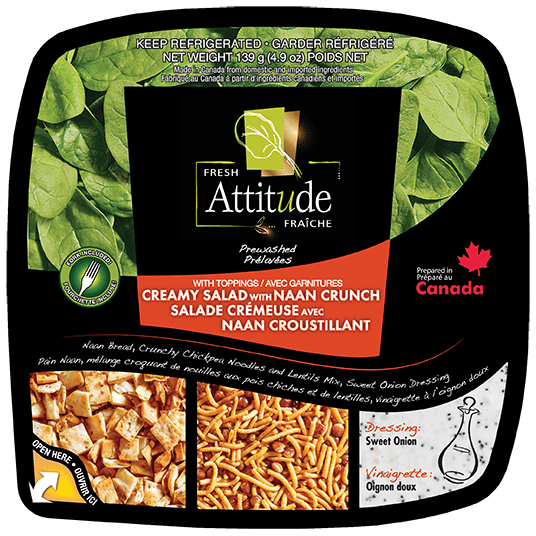 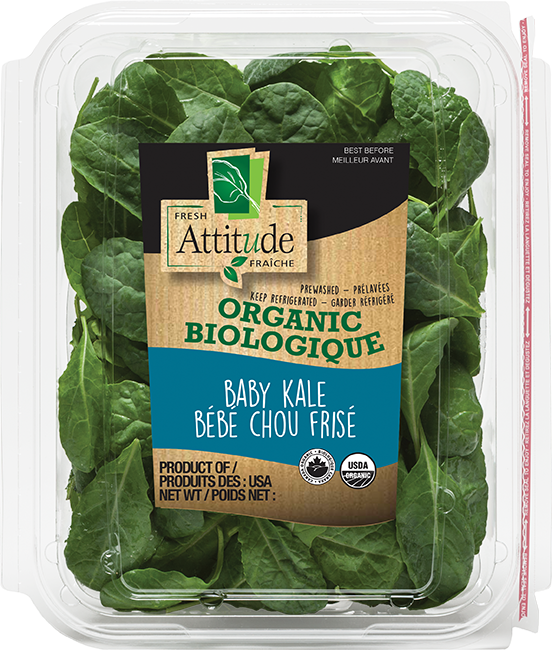 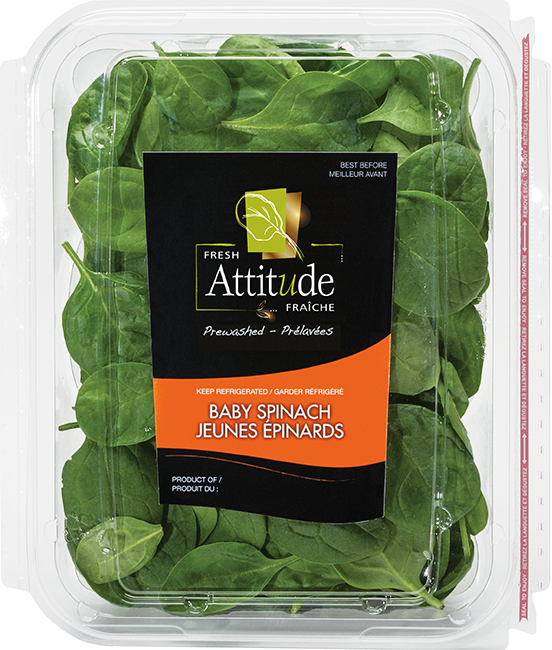 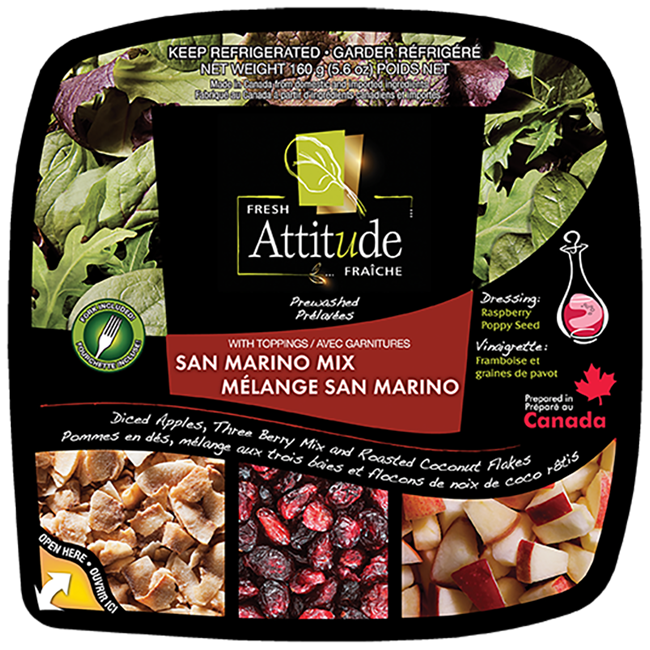 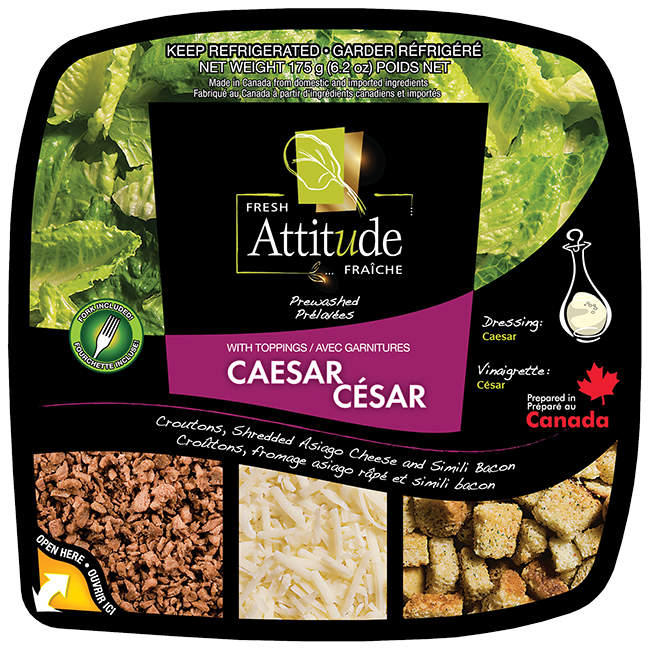 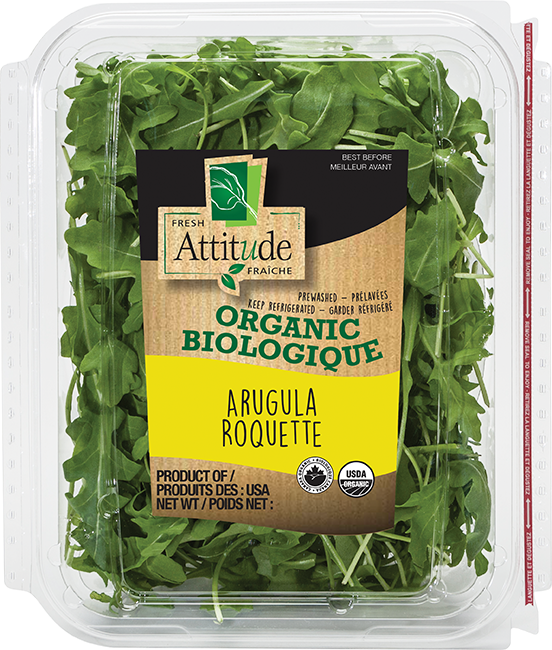 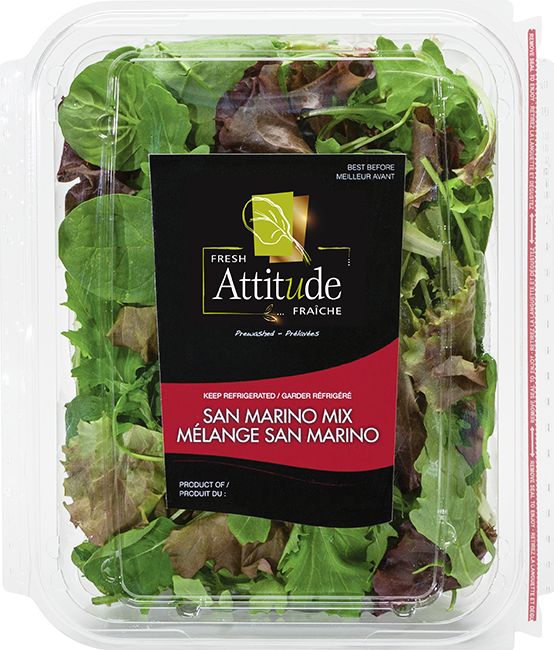 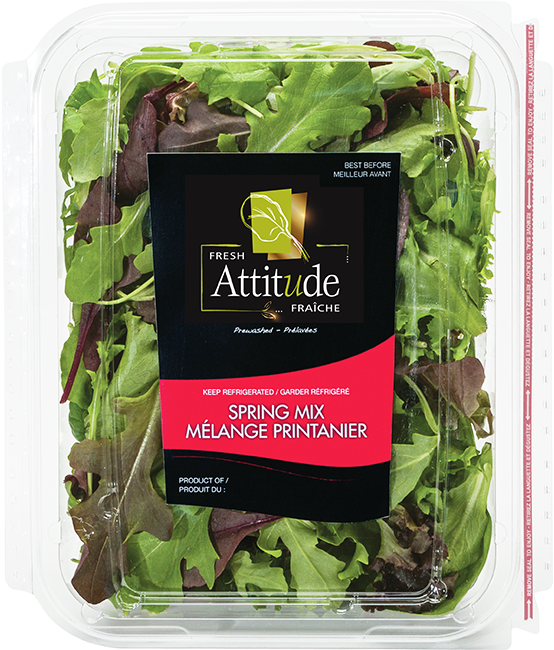 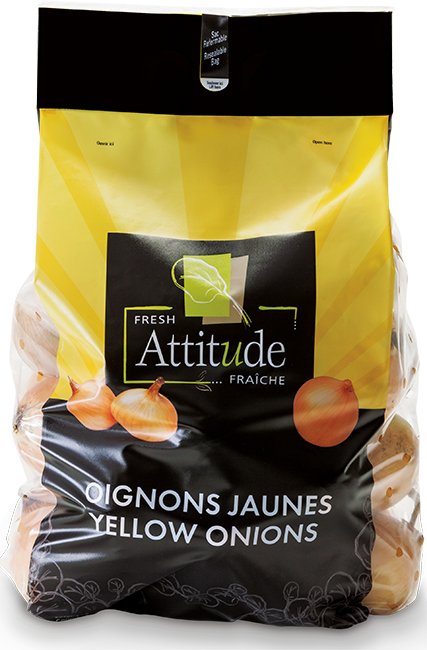 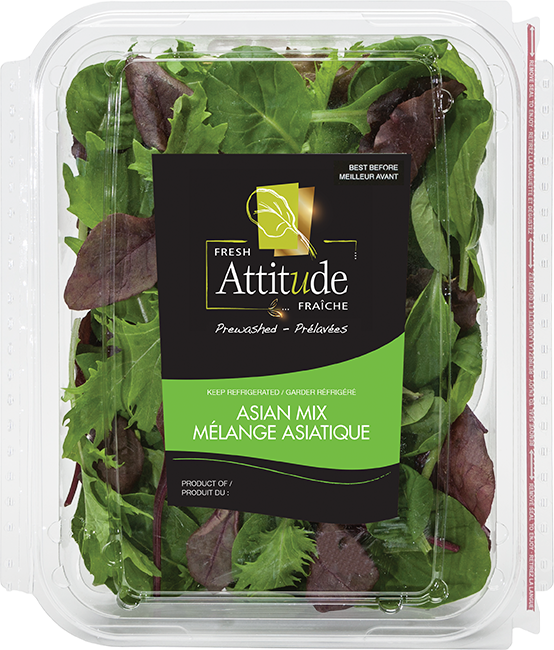 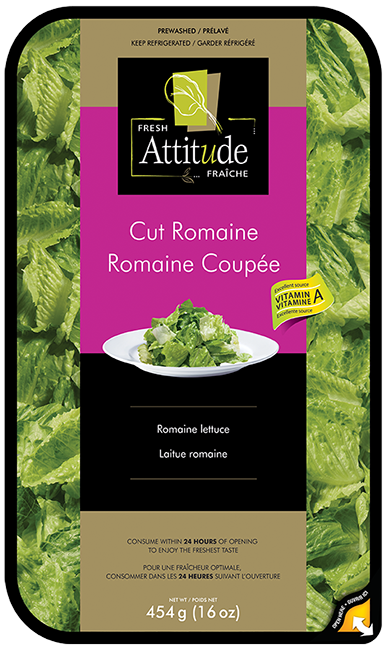 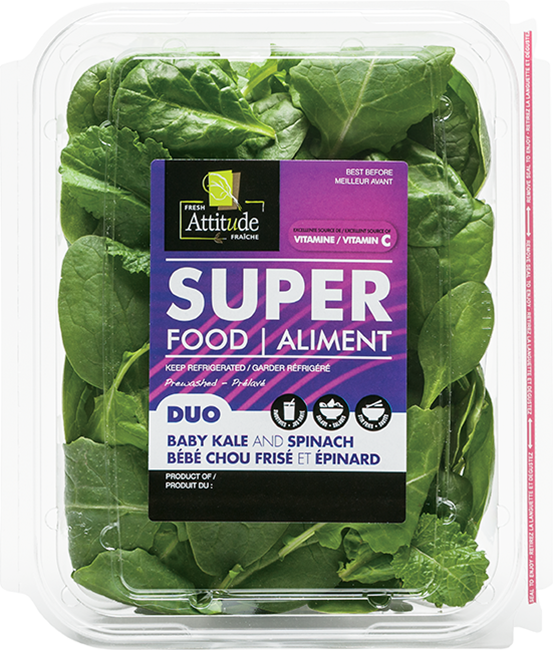 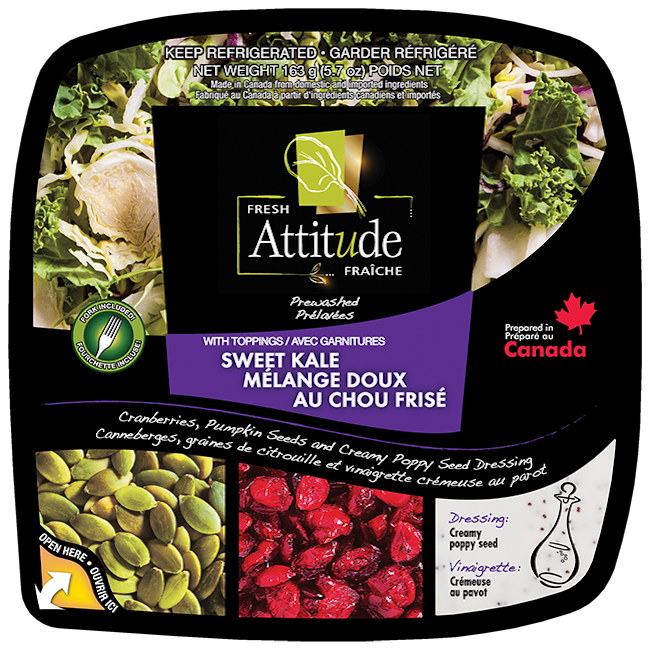 Certified by Ecocert, our Fresh Attitude Organic lettuce blends and organic mesclun are made of baby greens carefully selected, thoroughly washed and nicely packaged in clamshells made of 100% recyclable plastic. 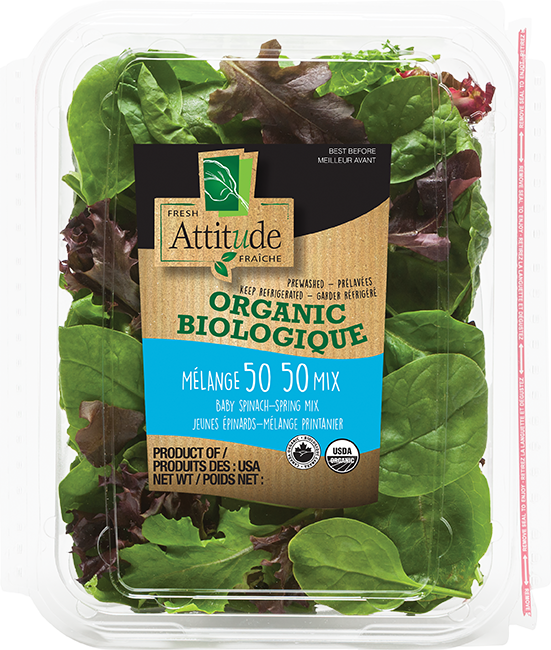 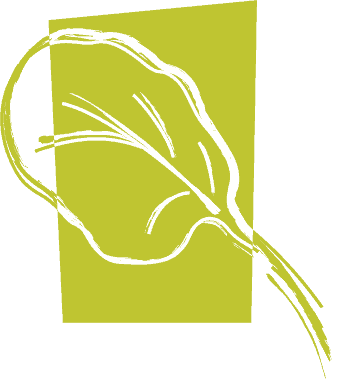 As of Fall 2018, we have also started to grow organic lettuces in the Okanagan Valley, making it the first large scale organic production of this type in Canada. 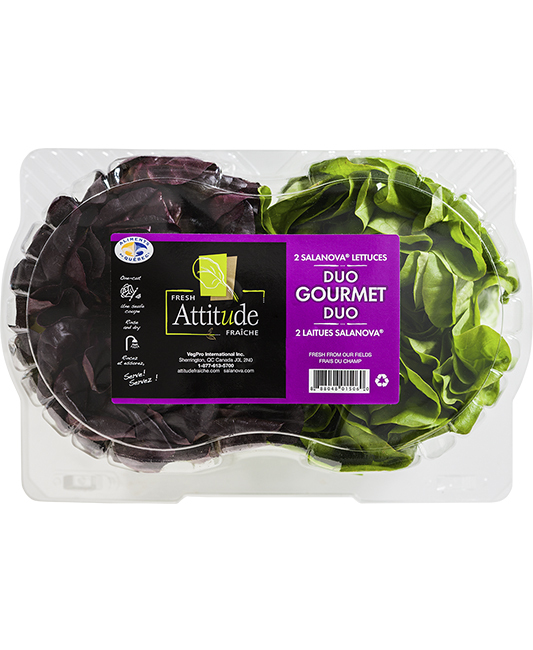 Conveniently packed in separately sealed trays to preserve the integrity of the toppings, our salad kits combine fresh salad blends to a trio of tasty ingredients and dressing, free of artificial colouring or preservatives. 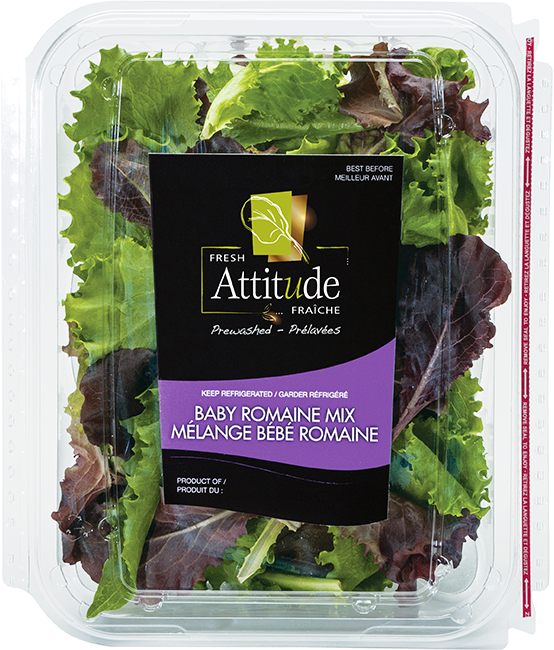 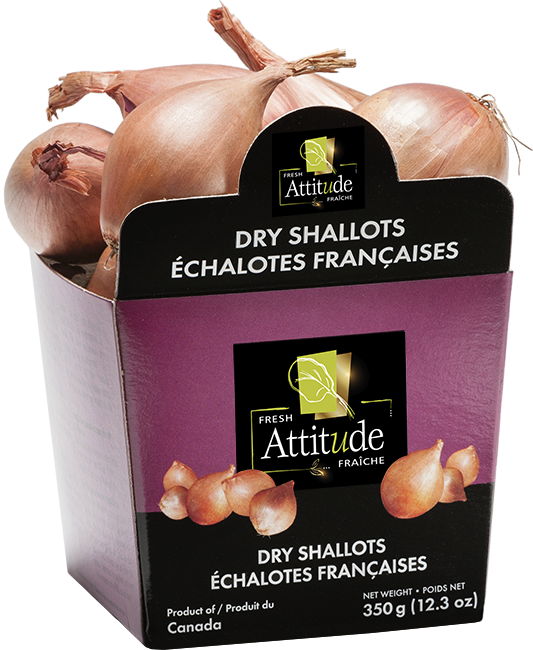 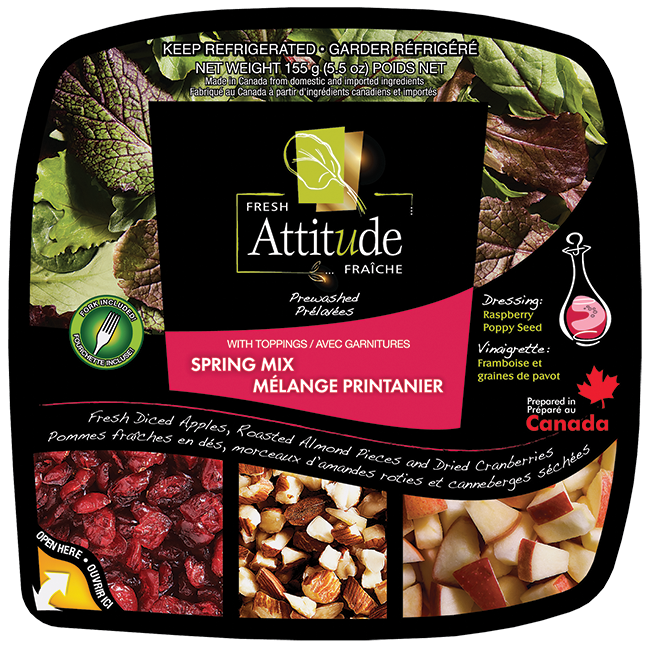 Available in family-size or single-serve clamshell packs, they are an ideal healthy and ready-to-eat salad solution at home or on the go. 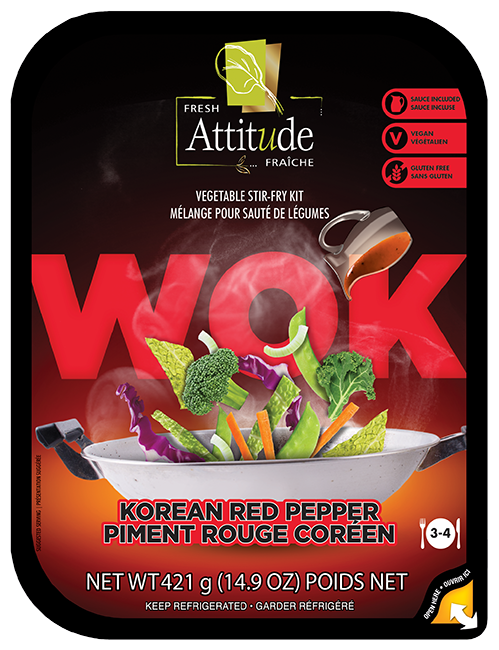 Available in a family-size pack, these fresh vegetables stir fries are easy to cook in a wok or pan in just a few minutes. 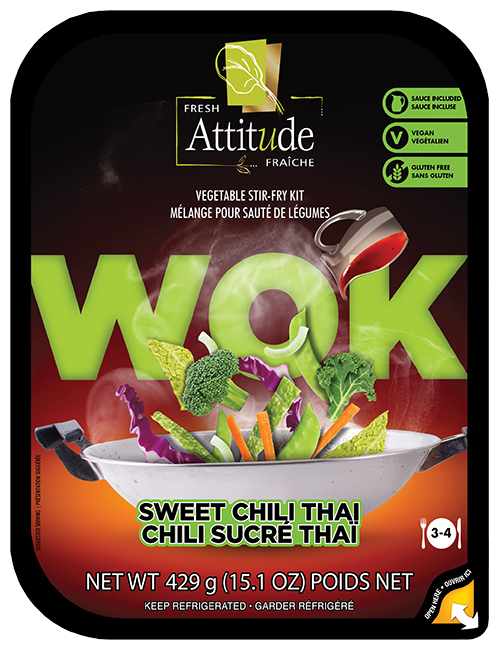 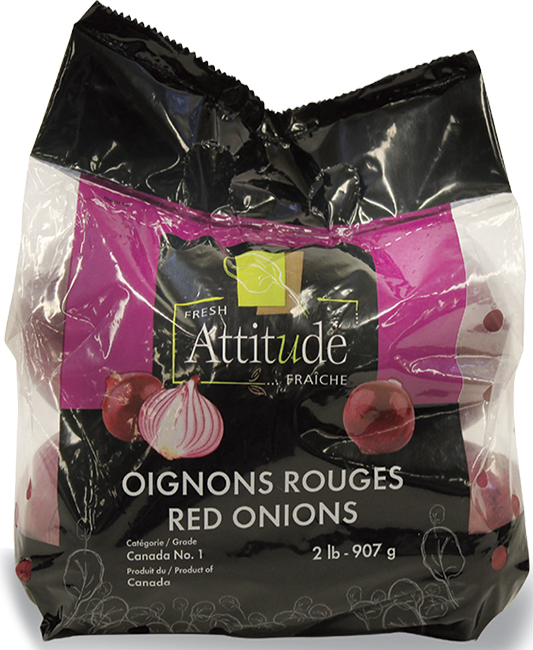 Made from eight prewashed and crisp vegetables, they are enhanced with one of four exclusive and exotic sauces. 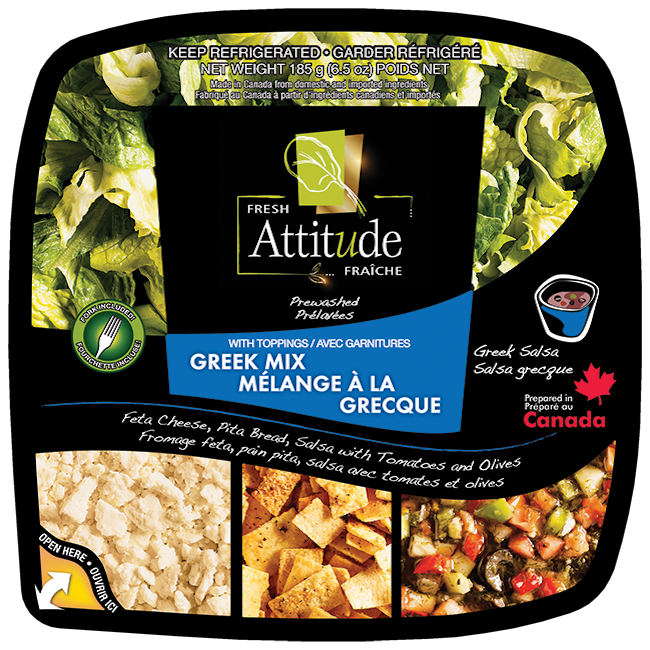 Vegan and gluten free, these delightful ready-to-cook kits are ideal to side with poultry, beef, fish, seafood or vegetable protein. 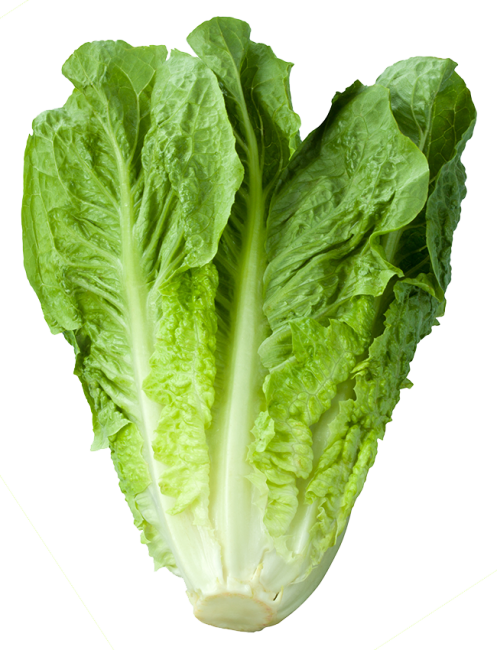 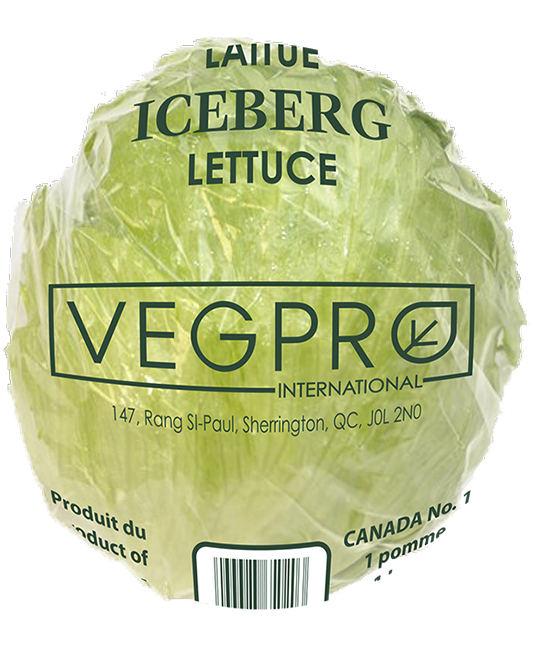 Lettuces are the original specialty of Vegpro. 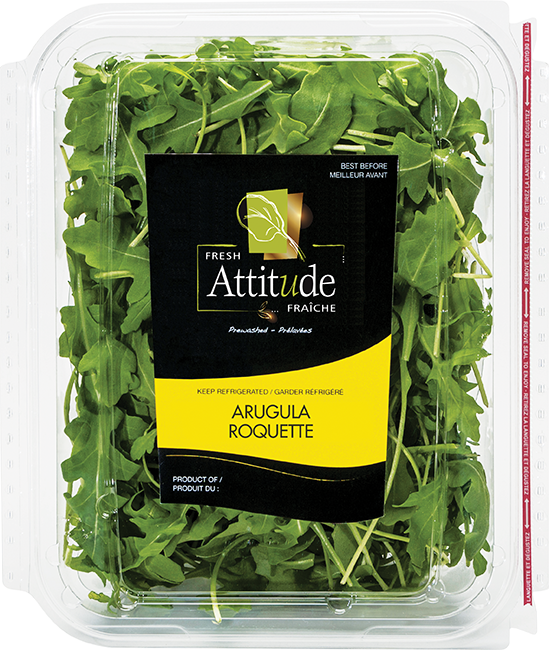 Through our farms, 100% of the volume sold is grown by our own teams. 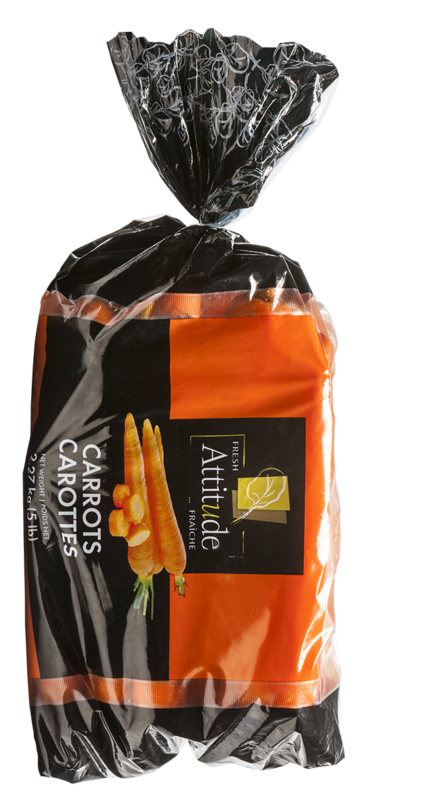 We adhere to the highest standards of quality and safety. 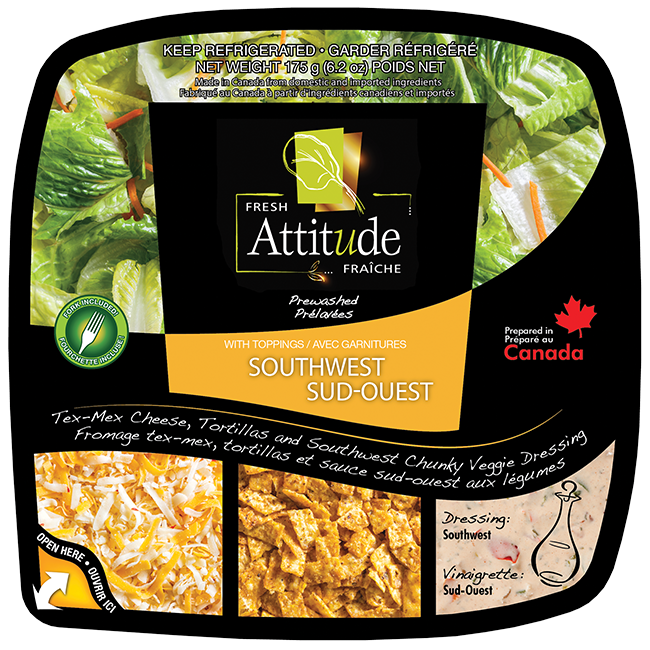 Our geographical position allows us to deliver year round to major markets on the East Coast with minimum delay.